(E-Z Play Today). 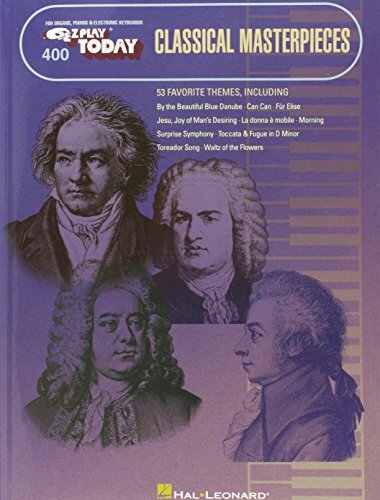 53 favorite classical themes in our world-famous notation: Air on the G String * Alleluia * Ave Maria * By the Beautiful Blue Danube * Can Can * Clair De Lune * Dance of the Sugar Plum Fairy * 1812 Overture, Excerpt * Fur Elise * Jesu, Joy of Man's Desiring * La Donna e Mobile * Liebestraume (Dream of Love) * The Merry Widow Waltz * Toreador Song * Wedding March (Bridal Chorus) * more. (E-Z Play Today). 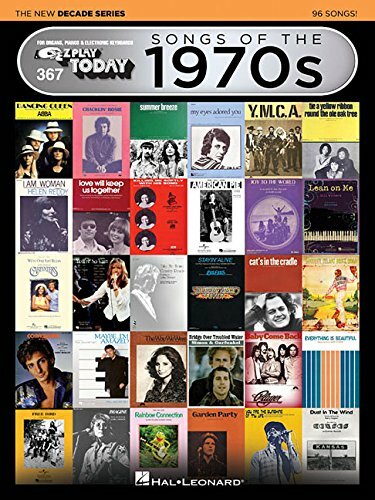 26 pop songs that feature the piano, including: Beautiful * Bless the Broken Road * Breathe * Every Breath You Take * Fallin' * I Will Remember You * Landslide * Ribbon in the Sky * We've Only Just Begun * You Are So Beautiful * You Raise Me Up * Your Song * and more. (E-Z Play Today). Nearly 70 big hits arranged in our easy to read and easy to play E-Z Play Today notation. 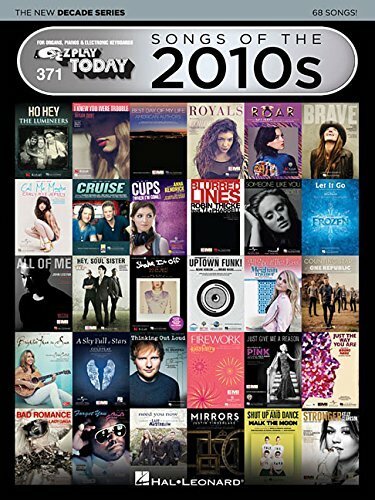 Songs include: All About That Bass * All of Me * Baby * Bad Romance * Best Day of My Life * Blurred Lines * Brave * Call Me Maybe * Counting Stars * Cruise * Cups (When I'm Gone) * Firework * Forget You * Happy * Hello * Hey, Soul Sister * Ho Hey * I Knew You Were Trouble * I Won't Give Up * Jar of Hearts * Just Give Me a Reason * Let It Go * Mean * Moves like Jagger * Need You Now * Roar * Rolling in the Deep * Royals * Shake It Off * Shut up and Dance * Some Nights * Stay with Me * A Thousand Years * Uptown Funk * We Are Young * What Makes You Beautiful * and more. (E-Z Play Today). 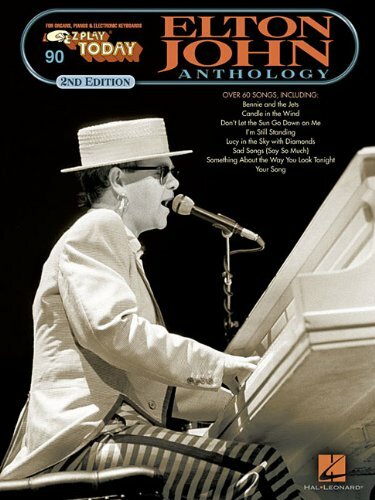 Over 60 of his greatest hits, including: Bennie and the Jets * Candle in the Wind * Crocodile Rock * Daniel * Goodbye Yellow Brick Road * I Guess That's Why They Call It the Blues * I'm Still Standing * Lucy in the Sky with Diamonds * Philadelphia Freedom * Rocket Man * Sad Songs (Say So Much) * Tiny Dancer * Your Song * and dozens more. (E-Z Play Today). 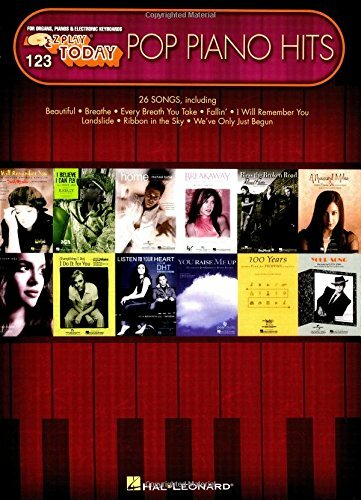 A giant collection of 71 all-time favorites in our famous notation. 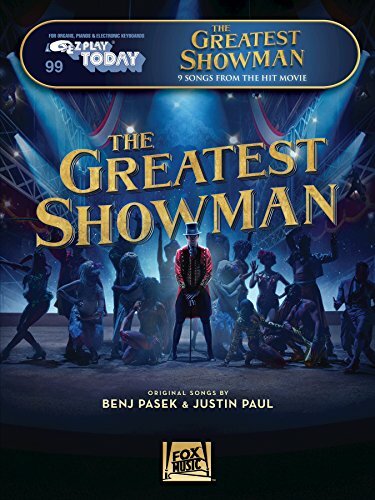 Includes: Alfie * April in Paris * Beauty and the Beast * Beyond the Sea * Cheek to Cheek * Desafinado * Heart and Soul * Hey Jude * I Dreamed a Dream * If * In the Mood * Just in Time * Misty * My Heart Will Go On * Nature Boy * One * Tenderly * Witchcraft * Young at Heart * and many more! (E-Z Play Today). 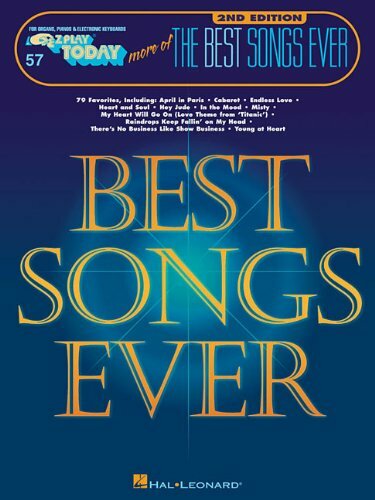 41 truly memorable songs are presented in our patented E-Z Play Today notation. 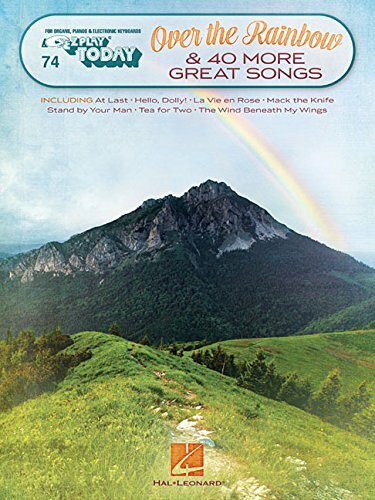 Includes "Over the Rainbow," plus: At Last * Feeling Good * Hello, Dolly! 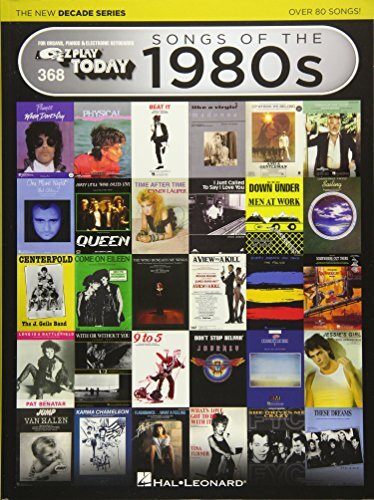 * I'd like to Teach the World to Sing * La Vie En Rose * Mack the Knife * Theme from "New York, New York" * On Broadway * Stand by Your Man * Tea for Two * The Wind Beneath My Wings * and many more. (E-Z Play Today). 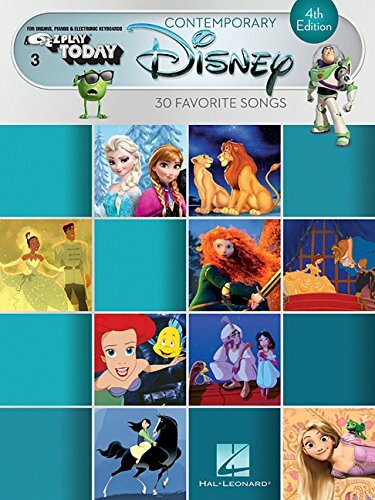 This 4th edition has been updated to include favorites from recent Disney films and TV shows including Frozen, Brave, Tangled, Sofia the First , and more. Includes: Almost There * Be Our Guest * Can You Feel the Love Tonight * Colors of the Wind * For the First Time in Forever * Hakuna Matata * I See the Light * Lava * Let It Go * Reflection * Touch the Sky * We're All in This Together * We Belong Together * When Will My Life Begin? * A Whole New World * and more. ALEX Toys Gigantic Step and Play Piano lets you have hours of big musical fun with this giant vinyl keyboard! This toy features eight instrument sounds and four different play modes including a demo mode. Choose from piano, saxophone, violin, accordion, trumpet, harp, xylophone and guitar sounds to create your musical masterpiece. Test the sounds in Play mode then record your tune and use the playback feature to share it with family and friends. This giant box of fun contains a 71in. x 29in. vinyl keyboard with recording and playback capabilities. Requires four AA batteries (not included). Recommended for children three years of age and older. Kick play time up a notch with this deluxe gym featuring five light-up piano keys, a repositionable toy arch, and four musical settings that keep your little one rocking out for years! As your baby grows from lay and play to tummy time to sitting up at the piano, you can change up the music and learning, too! Smart Stages technology lets you change the learning content to best fit your baby's age and stage, while real piano notes encourage your little Mozart to create a tune of their own! With the KidKraft Lil' Symphony Piano Toy, your little one can take part in epic jam sessions or put on concerts for the whole family. Designed with creativity and imagination in mind, this product encourages experimental play and is a great way to help kids develop an interest in music. This KidKraft piano is created with quality plastic and composite wood materials for a solid and durable construction. Pair it with other instruments in the set to get a whole band going (each sold separately). Children’s Toy Piano 25-Key Colorful Musical Upright Piano with Sounds for Learning to Play for Children, Toddlers by Hey! This 25-key Upright Children’s Piano by Hey! Play! is perfect for your little musician! With keys sized and spaced specifically for little hands, this piano is an excellent way to introduce your child to music and have them learn to play. Each key is tuned so your little one can learn simple songs and practice scales. The piano’s compact size makes it a great fit for any kids’ playroom, and its sturdy pinewood construction makes it stand up to heavy use in places like a preschool classroom or daycare. Unlike most toy keyboards, this miniature piano doesn’t run on batteries or a wall-outlet, so your child’s fun never ends! SATISFACTION GUARANTEED: Hey! Play! is committed to providing the consumer with the absolute best price and value on our entire line of products, which we ensure by applying a rigorous quality control process. NOTE: This is an exclusive product of Hey! Play! and 25-Key Upright Children’s Pianos by Hey! Play! are GUARANTEED to be genuine IMPORTANT: Avoid buying counterfeit products and transacting with unauthorized sellers. Look for our logo on the packaging for every one of our products. Specifications:Material: Polyester cloth + IC circuit boardColor: Multi colorsGender: UnisexPower: 3 * AA batteries (not included).Size: (L)X(W) 110X36cm/43.31X14.17(appr. )FeaturesBrand New and high quality.Baby can crawl on the mat to develop athletic ability.Lifelike piano pattern, easy to catch babys attention.Children can also go to touch, also can use feet to kick up.The surprise of finger touching will stimulate kids curiosity and hearing ability.Through the music and the voice of the carpet can stimulate babys ability of logic.Package included: 1 Pcs Play Mat（the battery not included）Notice:Please allow 1-3cm error due to manual measurement and make sure you do not mind before ordering.Please understand that colors may exist chromatic aberration as the different placement of pictures. Packaged included:1 x set Baby Gym Play Mat4 x Toy Pendant1 x Toy Aircraft1 x Remote ControlSpecifications:Name: Baby Gym Play MatModel: 698-63Color: Pink, BlueMaterial: Green Acrylonitrile Butadiene Styrene, PP cotton, electronic componentsSuitable age: 0-36 monthsPiano Battery: 3*AA batteries (not included)Toy Aircraft Battery: 3*AAA batteries (not included)Maintenance: Washable (dry naturally)Size: 74x60x43cm/29.1"x23.6"x16.9"Features:- Lie down and play, stent pendants allow babies do grasping, shaking activities, exercise leg strength.- On the stomach and play, baby and toys close interaction, play in the pro motion of back muscle and neck development.- Sit and play, can freely adjust the height of the piano, built-in massive early education content, play in the pro motion of low back muscle development.- Auditory development, when babies tap on the piano keys, it will send out the sound of different music and thus stimulate babies sense of hearing.- Piano can be disassembled independently, placed in a crib or stroller, the music accompany the baby to sleep.- Smooth edge treatment of the piano, to create a safe playing environment for children.- Use of high quality cotton, soft and breathable, isolated from the dust interference on the ground, giving children a healthy playing environment.- Built-in 60 lullaby of the piano, high-quality, no excessive noise.- Configure remote control toy aircraft, built LED light projection, music player, story play, digital and letters teaching play, timing and other functions.- With remote control, emancipate mother hands, baby play independently.- Lightweight body foam bracket and cotton wrapped, sturdy support structure, solid, slip-proof and safe.- Simple installation and removal. Your mini-Mozart can kick up loads of musical learning fun with the Fisher-Price Smart Stages Kick & Play Piano. The soft mat piano rewards every kick from your baby with playful music and colorful lights, introducing early learning concepts like colors, shapes, numbers, and animals. Plus, with three Smart Stages levels, you can switch up the learning content to fit your baby's age and stage! Easily attach the Kick & Play Piano to a crib with the convenient ties, or lay on the floor for tummy time or sit-up play.